Let’s start with our dry ingredients! 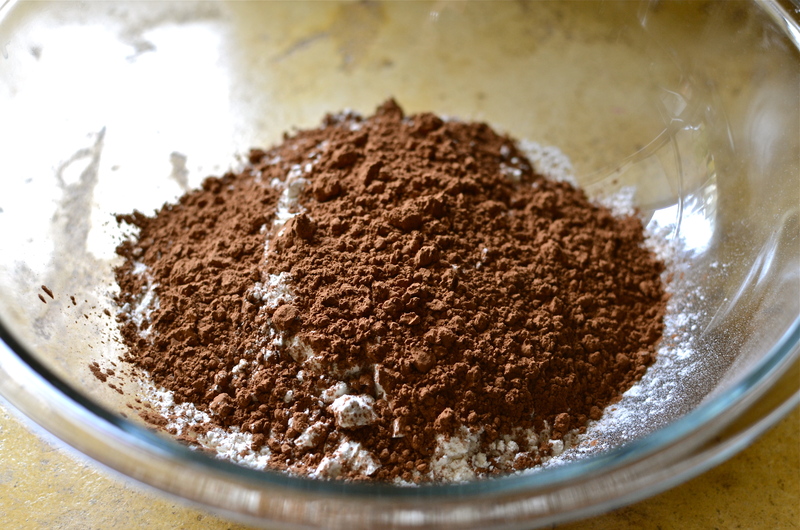 In a bowl combine 4 cups of flour, 1 cup of coco, 3 teaspoons of baking soda and 1/2 teaspoon of salt. In another bowl mix together 2 cups of sugar, 2 teaspoons of vanilla, 1 1/2 cups of mayo and 2 cups of coffee. I know this cake isn’t sounding so great yet (coffee & mayo?!) but trust me! The coffee is there to help enhance the chocolate and the mayo is being used in place of eggs and oil. What is mayo made out of? Eggs and oil!! Gradually mix your dry ingredients in with your wet ingredients. Things are starting to look a little better, huh? 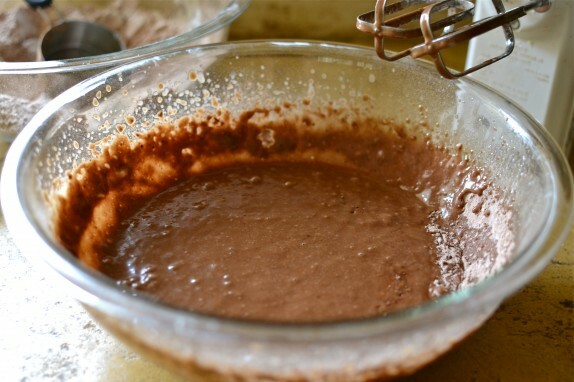 Pour your batter into two 9 by 13 inch pans and pop them into a 350 degree oven for 25 – 30 minutes. While the cakes are baking lets make some ganche! 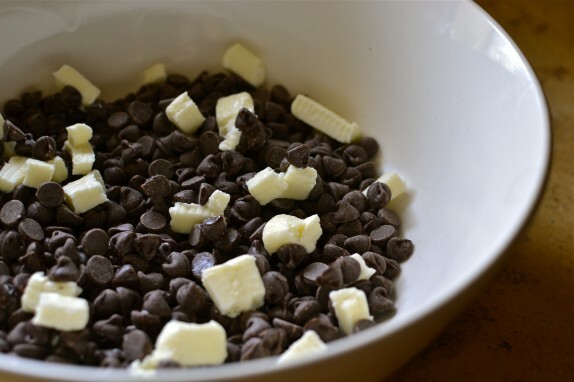 In a bowl combine 12 ounces of chocolate chips (semi-sweet, milk chocolate, dark chocolate, it’s totally your call!) and 3 tablespoons of butter. Heat 1 1/2 cups of heavy cream to almost boiling then gradually stir that into your bowl of chocolate and butter. 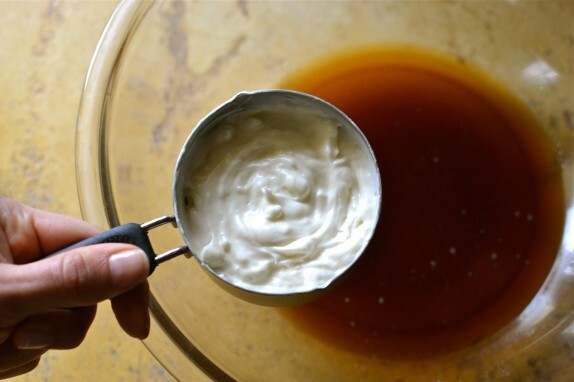 You could also add a couple tablespoons of brandy or amaretto liqueur. Yum! 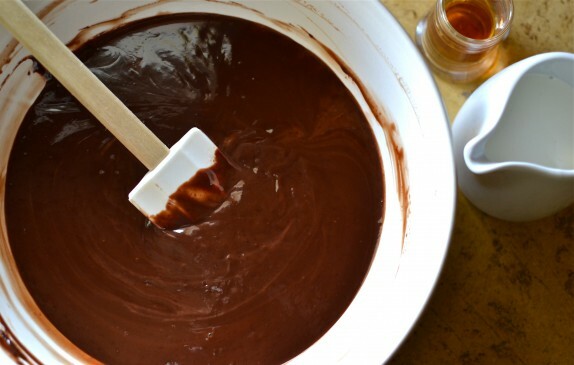 When your ganache is nice and smooth pour half of it into another bowl then pop it into the freezer for 10 – 15 minutes. You’ll see why in a minute! Look at this beautiful cake! Moist and chocolaty, nobody ever has to know that mayo is involved. When your cakes have cooled slice the roundness off the tops. 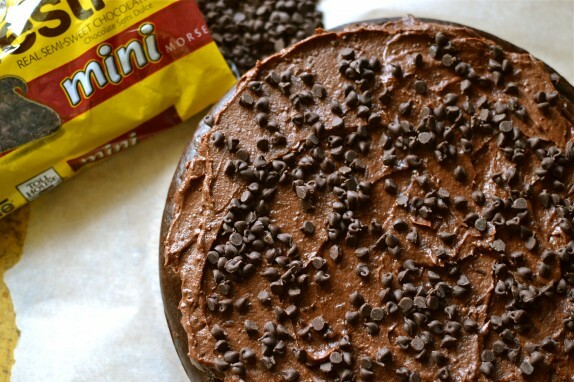 This will help make frosting them much easier! Speaking of frosting remember that ganche we put in the freezer? Well take it out and give a few good stirs with a fork. You’ve just made a thick and creamy frosting perfect for the middle of your cake! 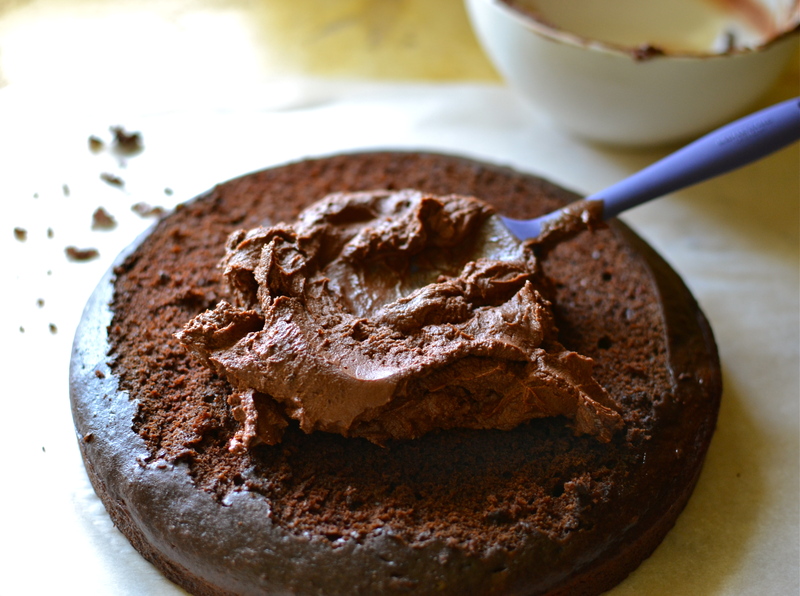 I love how a little change in temperature totally changes the texture of the chocolate! 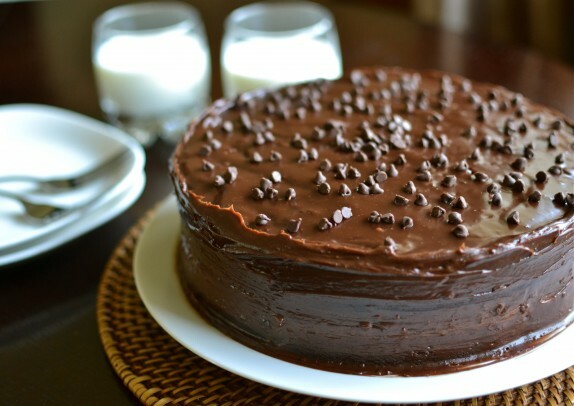 Spread your chilled ganache on the bottom layer of your cake and top it with a few handfulls of mini chocolate chips. 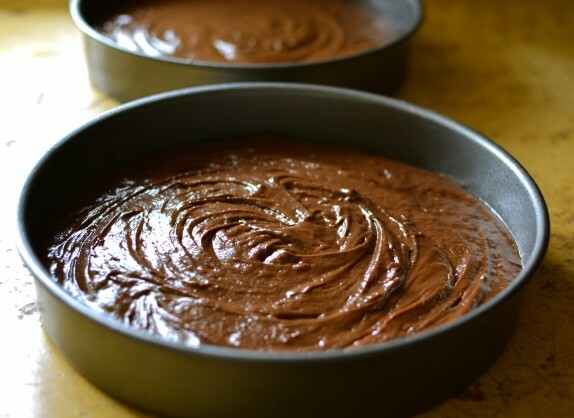 Stack your cakes on top of each other and use your room temperature ganche to frost the outside of it and don’t worry about making your cake look too perfect! 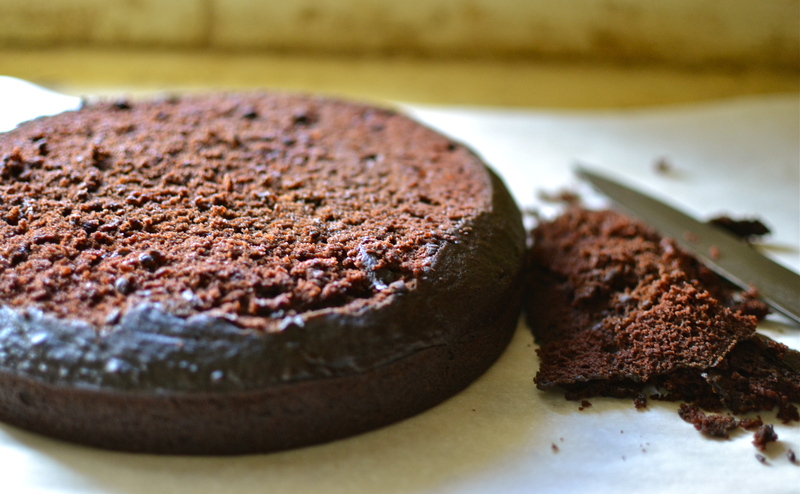 Imperfections give this cake (and us) a nice bit of character. I hope you and your family enjoy your spring break. Who knows you might have a Moon Doggie in the bunch (Gidget surfer movie). That Shannon has some talents, I’m glad she’s in your life. The first thing that caught my eye was the delicious-looking cake in the photo, but to be honest, I shuddered a little when I read the title… After reading the whole thing, however, it doesn’t sound bad at all! Mayonnaise is made of eggs and oil, after all! I’m making this right now…how did you know I needed a cake recipe for tonight?? Haha! Make this cake Brandon, you won’t be sorry! Janet, how did it turn out? !